Microcontroller Programming » Trouble Wiring AVR ISP mkII programmer to mcu, please help. I'm having some serious problems wiring a programmer up to an MCU (I've tried two so far (1284P, and 162), and when I go into atmelstudio 6.0 and try to read voltage it ALWAYS returns 0. I simply can't seem to figure out how to get past this and need a push in the correct direction. I've also read that some programmers supply the voltage so I unplugged my power source and tried the programmer only with no luck. I've even tried measure voltage from the vcc/gnd pins from the programmer and feel mine does not follow this trend for no voltage is read. I'm very stuck on this and I'm open to any suggestions anyone might have. My overall goal is to get my 1284P programmed which opens up to a new series of questions but I'd love just to be able to get some type of reading first. pictures and screenshots can be shared as well but not sure what to take a picture of yet. lets start with what programmer you are using? They do not all have the same power requirements. 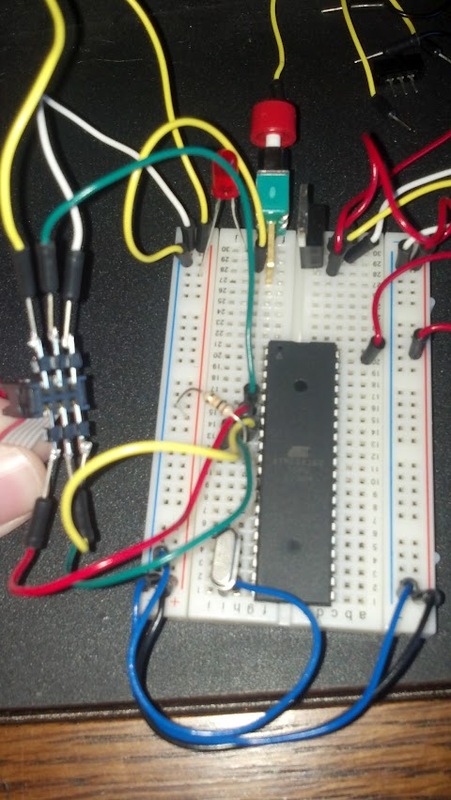 The ATmel AVRSPmkII requires that the "target" be self powered. The ATmel Dragon powers the target. I am using the atmel avrISP mkII. (url: http://www.atmel.com/tools/avrispmkii.aspx) it's definitley not the dragon. Duh of course, with the avrISP mkII the target has to be powered. The led (not the one next to the USB connection will be red if there is no power to the target and green if there is power. I just discovered that you only need 2 volts to power the target but you can not program at 2 volts but you can view and set the fuses etc. What are you using for a target? If you are using a breadboard then some pictures might help. Well pictures of your wiring no matter the target might help. Chances are it is a wiring error. Thanks for taking the time to help. I attempted to take a few pictures to show the wiring. My overall goal is to get a 1284p programmed but in this image I'm testing on a 162. What strikes me as odd is, when I read the voltage the programmer remains red (no target power), but when I attempt to read the device signature it tells me there is no power then changes the led to green as if connected but it can't get into programming mode. It may be somewhat difficult to see clearly but I think my other post above described what pins I'm going to from the spi. I have no doubts I have a wiring issue somewhere but I just can't seem to figure anything out. Oh, and I think I mentioned I was using a 10k resistor on the reset line, and I was reading the mkII user manual and they suggested nothing larger than 4.7k on the reset line, and I don't have any that size for now so I went with a 1k which may be to small. I've tried a lot of different things and I'm willing to try anything more. fishberg5051, is it just the angle or do you have the MOSI pin going to pin 5 on the 162 MCU? It should be going to pin 6. Is everything just off by one? Also the ATmega 1284P is not list as a supported device in the avrISP mkII User Guide I found on line but that might be a old version the ATmel 328 is also not listed. I think it's just the angle of the picture. Looking at my board in front of me and mosi is on 6. Miso on 7, SCK on 8 and Reset on 9. VCC on 5v rail, GND on GND rail of breadboard. Good I thought it might be the angle. Actually I was hoping that was the problem and you would be good to go. These types of problems can be very aggravating. I tried to find a 40 pin SIP Target board on Google but did not find anything. You could have a defective motherboard. Do you have a continuity tester to ring out the board and wiring? Is that resistor on the reset pin going to gnd or +? I think it should go to +. Yeah it's been pretty tough to troubleshoot this. 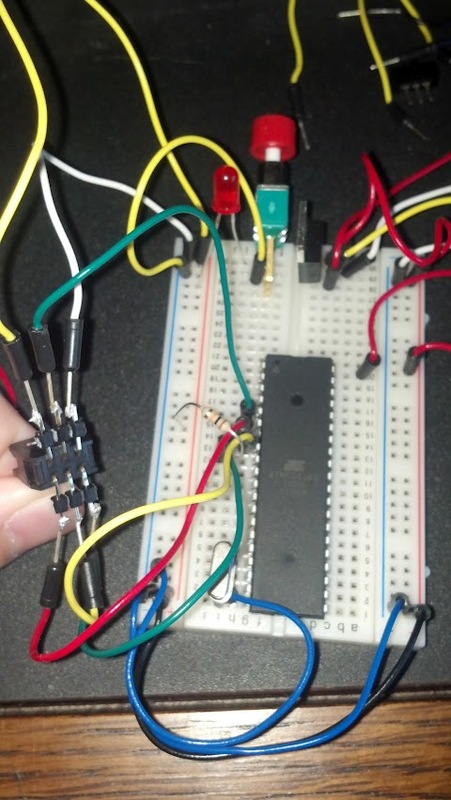 And to answer Noter's question, the resistor is going to the +5v rail, not GND. A co-worker suggested putting a 10k resistor from pin 2 (vcc) to grnd to drop 5v to 3.3v for that worked for him so I might try that. So in anyone's experience, how often to ribbon cables go bad? Trying to measure voltage through the ribbon cable and I'm getting nada :O ...might be my issue, still trying to confirm it. Doesn't seem to be my cable, for I was able to plug into an spi port on a manufactured board I have and it read the voltage off it just fine (uses an atmega 128). Just can't win. Time to quit for the day and come back fighting tomorrow. It looks like your plug is wired backward. The keyed side of the plug typically is the side with pin 1. The key appears to be at the top of your photo, which would show pin 1 going to 5V like Ralph said. I must be going blind. I've looked again and both your photos show the resistor going to the blue rail. Rick, does that mean the graphic Ralph posted is for the socket instead of the plug? That would explain why it is wired backwards. That graphic is from the AVRSPmkII user manual so it illustrates the socket. oh boy do I have an embarrased look on my face! That did not even cross my mind! I swapped the wires and it works like a charm! Thanks so much Ralph and to everyone who commented. Now I can start looking into all the fun of programming a chip...more questions to come on a new thread soon I'm sure lol! So fishberg5051, are you going to try to put the bootloader om the mcus? Of course you can just put a .hex program file directly on the mcu using ISP. Ya I've been playing with loading the program directly onto the MCU, but I thought it would be a good learning exercise, plus if I keep getting my wires mixed up I'll probably end up frying my programmer at the rate I'm going :P haha! You have a debugger in AVRStudio that would be great to learn. Glad you have it all working.